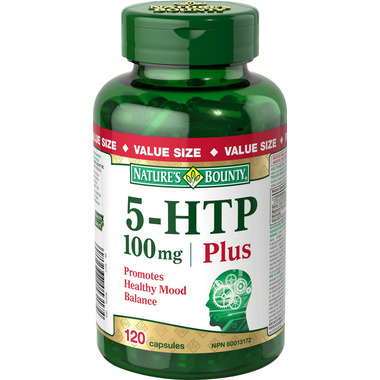 5-HTP helps neurotransmitters in sending messages through the nervous system that contribute to your mood and well-being. It helps maintain a positive outlook and supports a calm and relaxed mood. Adult Dosage (Oral): Adults, take one (1) capsule, three times daily with meals. Use for a minimum of 1 week to see beneficial effects; consult a health care practitioner for use beyond 1 year. Non-Medicinal Ingredients: Dibasic Calcium Phosphate, Gelatin, Silicon Dioxide, Magnesium Stearate. WARNING: Consult a health care practitioner prior to use if symptoms persist or worsen or if you are taking carbidopa or drugs/supplements with serotonergic activity such as L-tryptophan, S-adenosylmethionine, St. John's wort, antidepressants, pain killers, over the counter cough and cold medication containing dextromethorphan, anti-nausea and anti-migraine medication. Discontinue use and consult your healthcare practitioner if you show signs of weakness, oral ulcers, or abdominal pain accompanied by severe muscle pain or if you experience skin changes. Consumption with alcohol, other medications or natural health products with sedative properties is not recommended. Exercise caution if operating heavy machinery, driving a motor vehicle or involved in activities requiring mental alertness. Some people may experience drowsiness, diarrhea, nausea, vomiting and abdominal pain. Do not use this product if you are pregnant or breastfeeding or have scleroderma. I started using this to help me sleep. Been enjoying better quality sleep. Not waking up feeling groggy. Having been on prescription sleeping pills, this product is all I need now to get to sleep - I take one nightly! Best product ever! Product arrived very quickly and I've been on it now for a couple weeks and feel much better! C'est un bon produit efficace sur le moral. This product is high-quality and really works for reducing anxiety, improving sleep and regulating emotions. Note that it won't make your mood swings or anxiety go away, but it will help take the edge off so you can rationalise them or cope better. I didn't experience any side effects. I started with one pill a day (AM, with breakfast) and after a week I increased to 2 (breakfast & lunch). I'm still on 2 pills a day and find that dose is enough. I believe the 5htp is improving my sleep. I take 1 morning and night. I regularly get about 6 hours sleep a night now--better than 3! I have fibromyalgia and this product definitely helps with my pain and sleep. I cannot function without it. After months of waking up several times during the night due to anxiety, I am finally getting a good night's sleep. I am less anxious and I feel happier in general! This product really helped me! This 5-HTP product has been extremely helpful for me. I have been taking 1 capsule every morning and by around day 2-3 I noticed I had a much more stable mood. After about a week of usage I also noticed that I responded much better to stressful and fearful situations that would have otherwise triggered my anxiety. My friends and family have also noticed me being relatively happier throughout the day. Also - vitamin b6 is crucially needed in the brain for creating serotonin on a day-day basis, so for that reason I am glad they included b6 in the capsules. Price is reasonable and the quality is great. I find the extra ingredients (valerian, magnesium, niacin, B6) give the 5-htp an extra boost. The value packaging is also worth it. I started to feel a difference in my mood after taking this product. This is a wonderful product that has helped with my depression and anxiety symptoms. I have been using this product for about 1 1/2 months for anxiety/stress/mild depression symptoms, the word that I would use to describe it is that it helps me to feel more "chill". I seem to be able to respond to some of my anxiety triggers in a much more relaxed way, and I don't feel so edgy. 5Htp has been an effective antidepressant and anti anxiety herbal supplement for me. I have taken it for 1 year for mild symptoms and have felt markedly better and more even keeled.